In this tour we follow some of the least explored trails of Northern Albanian Alps. It is a great tour for experienced travelers who would like to be challenged everyday while enjoying the beauty of the Alpine Pastures. Even though we provide blankets and mattresses in the huts, you might feel more comfortable bringing your own sleeping bag. When the group arrives in Albania they will be welcomed by our tour leader and transferred to Rubik. In Rubik we will be accommodated in the Marubi eco hotel. Depending on the time we can make a 2 hour walk to the nearby village or we can go and enjoy the spectacular view of the 12 century old Rubik Church. Dinner and overnight in Rubik. In Kosovo we will make a short visit to Prizren. Prizren is known for it’s Ottoman architecture, ancient mosques and beautiful churches. During the Ottoman period it was one of the most important centers of Kosovo. Prizren is one of the few cities in Kosovo to have 3 religious communities cohabiting together (Catholic, Orthodox, Muslim). In Gjakova we will walk through it’s old bazaar, one of the longest in the Balkan, itself a beautiful testimony of Ottoman architecture. In the afternoon we will reach the village of Tropojë and be accommodated in the village houses. After loading our luggage on the horses, the local guide will lead us up the banks of Tropoja River. 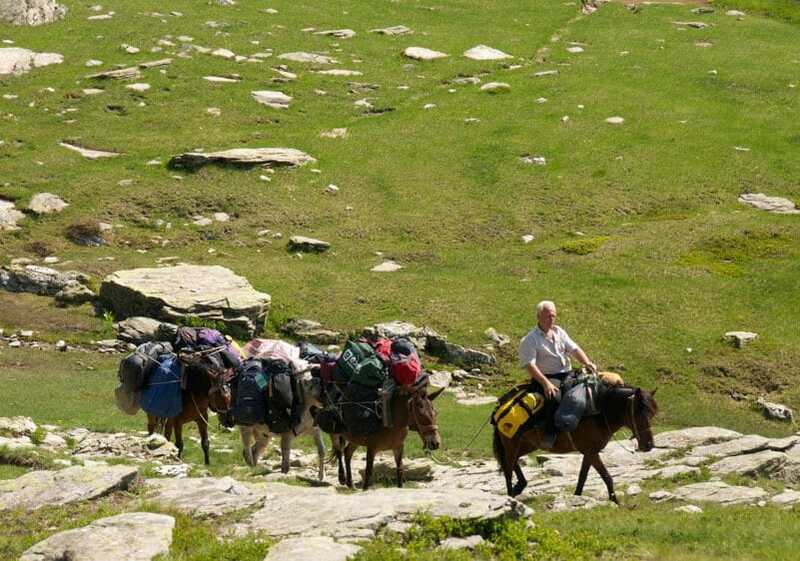 The journey will last about 6 hours and at the end we will arrive in the Sylbicë Alpine Pastures. After breakfast we will load our luggage on the horses and start walking to Dobërdol. On the way we will have time to take breaks and enjoy the scenery of the Alps. 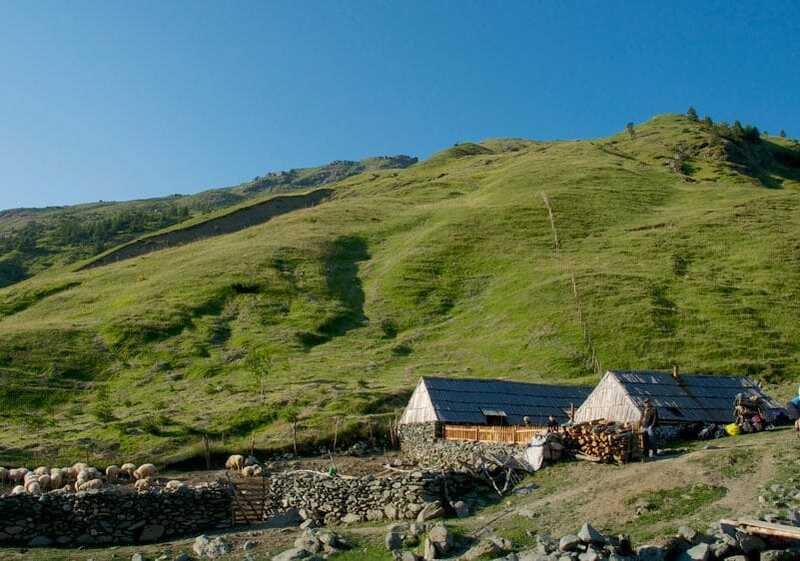 Today we will walk from Dobërdol to Çerem passing through Koshutica and Vranica alpine pastures. Lunch is organized in the village of Çerem. Overnight in Valbonë. We need about 2-3 hours depending on the ability of the group to reach the summit of Valbona Pass at the altitude of 1815 m. From there the panorama unveiled of both Valbona and Theth valleys is breathtaking. In the afternoon we will reach Theth and stay the night in a guesthouse. 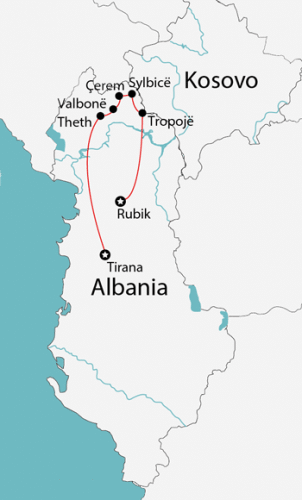 We will ride a minibus from Theth, through T’thore Pass, Boga, Shkodër and finally to Tirana. Shkodër has been a very important city for Albania since antiquity. Lunch will be in the city centre with a beautiful view of the pedestrian street where many coffee shops are situated. Next we will drive to Tirana and visit the city. We will have a 2 hour guided walk through the city center. Breakfast in Tirana. Free time. Transfer to the Airport where our tour will end.